There’s no point in having a quality parasol if you haven’t got a quality base. Mass produced bases sold by high street retailers, in our opinion, do not cut the mustard. They tend to not be heavy enough or are shabbily made and fail very easily. Our parasol bases are heavy as standard and built to last – meaning you may pay a little more at first but you will not have re-invest down the line. And this looks great in shiny, polished steel. Tightening Screw - to keep the whole thing rigid. 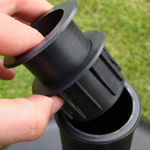 Plastic reducer that makes it suitable for holding 38, 48 and 58mm parasol poles with a screw fixing included – see featured image. For further support please call our Showroom in the Midlands. First off, the positives (I know this is not product related but felt important to include). Jessica here is extremely helpful and efficient. I placed my order online but realised upon receipt of order acknowledgement that I could not wait 3 -4 weeks for delivery.. our UK summers can be over in that time, so I rang in after placing my order and spoke with Jessica about upgrading/expediting my order. I chose to pay a premium for pallet delivery which duly arrived on time, so Jessica/this service is very worthy of 5 stars. However and now to the product review. I am somewhat disappointed in the finish of the base. It was well packaged so the damage to the steel had to be done in manufacturing / the factory and not at the garden furniture centre. It has a number of scratches to the sides and several indentations on the top. These dents on top are symmetrical / equal distance in pattern so evidence of occurrence during manufacturing. Possibly as they wrapped the concrete as it is basically a solid block of concrete wrapped in steel. I have still awarded 5 stars on price as seems to be the market value for a quality item so that is why I am disappointed and rated down value and quality as I wouldn't expect this damage on a premium priced item. Given the cost of returns and exchange and I don't hold GFC responsible I haven't bothered contacting them to exchange, but it is something potential buyers should be made aware of when buying steel/metal items.. Also on that note, two other things. When the bright sun hits it, it reflects light like a mirror..making for a blinding surface and being metal, it gets hot! It is heavy and does the job of securing our 3 mtr parasol in slight breeze. I wouldn't like to put it to the test in stronger winds. Shame about the cosmetic damage or I would 5 star across the board. stylish for a parasol base and HEAVY!